The Lobby Gallery of the I.M. 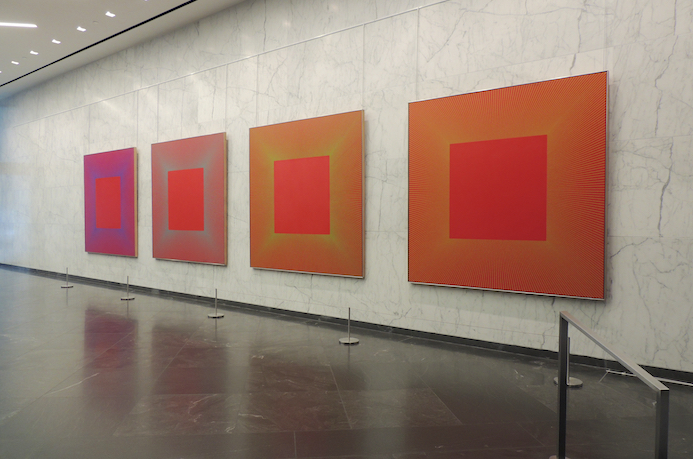 Pei designed office tower at 499 Park Avenue is now graced with an exhibition of six paintings by one of the founders and most important figures of Op Art, Richard Anuszkiewicz, on view through January 14, 2016. The paintings are on loan, courtesy of the artist and The Loretta Howard Gallery. The exhibition in the upper and lower atrium of the Lobby Gallery provides tenants and visitors with a dynamic display of six of his vibrant, paintings to enjoy and contemplate as they pass through the space. The exhibition features four paintings from his Centered Square series done in 1979 and first shown at the Brooklyn Museum, plus two of his more recent paintings. In 2000, the New York Times art critic Holland Cotter described Anuszkiewicz's paintings by stating, "The drama -- and that feels like the right word -- is in the subtle chemistry of complementary colors, which makes the geometry glow as if light were leaking out from behind it." For more information about creating a rotating art exhibition in your lobby, please call 845.251.1280 or email us.